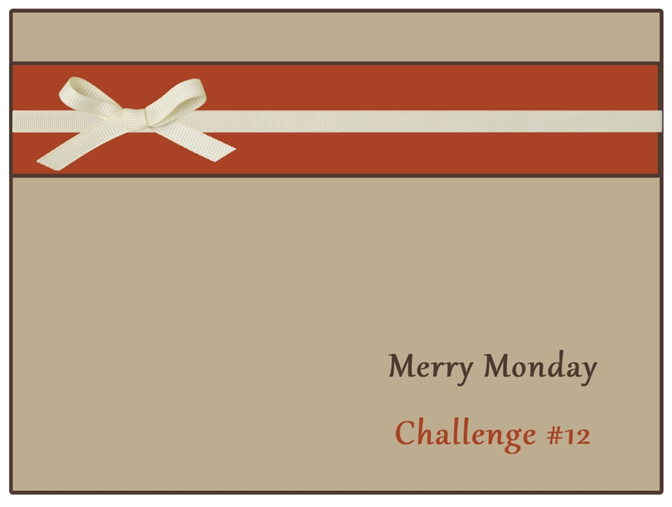 Welcome to another week at Merry Monday! 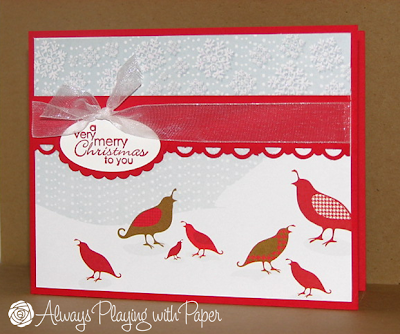 The idea behind this challenge is to get a head start on your Christmas cards! 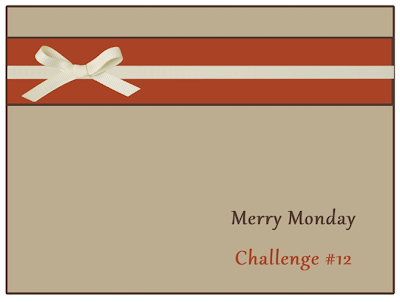 Each week, I choose one Merry Monday Winner who will then be a Guest Designer for a future challenge! So get out your Christmas supplies and let's get to work! This week's sketch is REALLY simple...I wanted to be able to create a card quickly and I wanted to use some of the Christmas paper I hoard stash away in my drawers. So here it is, what do you think? I must say, this card is made from "recycled" stuff from my "need to use drawer", that includes the ribbon and the card base in Real Red. Aren't the birds so "tweet". 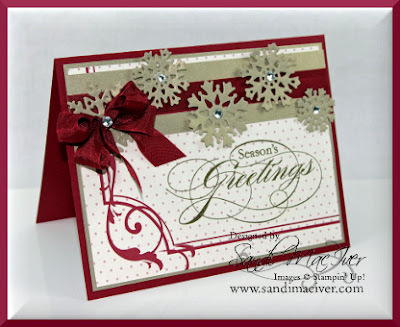 Tools: Scallop Edge Border Punch from SU!, Shimmer Ribbon, Oval Punches from SU! 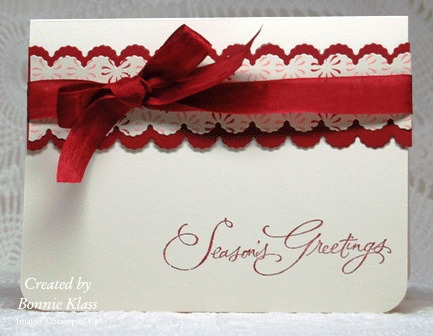 Below are the gorgeous cards created by Featured Designer Sandi MacIver and Guest Designer Bonnie Klass. Please be sure to visit their blogs by clicking on their name above their card. Great sketch Lesley and I love your card. Now you know we don't stash/hoard our paper! Lesley, I love these birds on the snowbank! I love this sketch. Thanks for the challenge. thanks for another great sketch, I had a ton of fun with this one! Nice simple sketch . .. As I also have a mountain of patterned paper it's a good simple way to use it. Looking forward to getting my stash out and playing along again! YAY!!! I actually made, and posted!, a card in time for your challenge!!!! I still have #7 & #10 to do, but I'm getting there. Thanks for such an awesome challenge! Great sketch, and yes, the paper is great! Great sketch! Your card is so cute, I love the paper. Lesley your little birds are darling, love this simple sketch. Great sketch and love your little "bird" card! Also wonderful creations by the guest and featured stampers! Awww I missed out this week. I only have time on Sunday's to do a little card making so I've been missing out on these challenges. Everyone did a fantastic job though and I'm getting so much inspiration from both the DT team and the entries. Good Luck everyone! Thank you for stopping by! I appreciate the time you took to leave me a little stamping love!! My name is Lesley and I am an avid card maker. I love my sweet husband Corey and our two furbabies...Rolley and Penney. 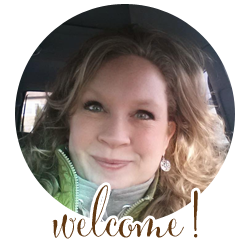 I have been crafting and blogging since 2009 and I am fortunate to have made such lovely connections with bloggers from all over the world. I love paper and blogging...it is a passion! Thank you for stopping by. A Brand New Look and Merry Monday Reminder! Today I am up on the SRM Blog sharing a couple of Christmas cards! Please CLICK HERE to check it out! Paper Issues Design Team Post!!! "Simply Sweet" Christmas Inspiration Hop with Friends and Prizes!